Recovering from property damage or complete loss can be overwhelming for any home owner or property manager. And yet, we know our customers deserve quality restoration services with an efficient process. That’s why our technicians have extensive certifications in multiple sciences through IICRC. They continue to stay up-to-date by using the latest techniques and methods, sharpening their skills to give our customers the best restoration results and confidence in a job well done. TRILINK is affiliated with DKI, the largest restoration network in North America. Should the need arise, we can expand our equipment and personnel base in a matter of hours. DKI not only serves as a network but a resource—for expertise and know-how. Our certified technicians and expert affiliations help make TRILINK Oklahoma’s expert restoration company—with nearly 50 years of experience. 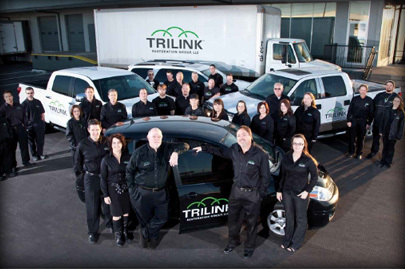 From our personable and efficient staff to our certified professionals and affiliations, TRILINK is Oklahoma’s trusted restoration source for homeowners and a restoration resource relied on by property managers and insurance adjusters. Trilink Restoration Services is rated 4.7 out of 5 based on 241 reviews from around the Web.